Test your wits and your knowledge of animals that fly, run, leap, swim, and burrow by guessing where they live. Don’t know exactly? No worries, because being “close” is still “good enough”. It’s a really, really big world full of amazing creatures and you are about to learn all about them! But this is not just any educational game! You must bid, bluff, outmaneuver, and out guess the other players before they do the same to you! 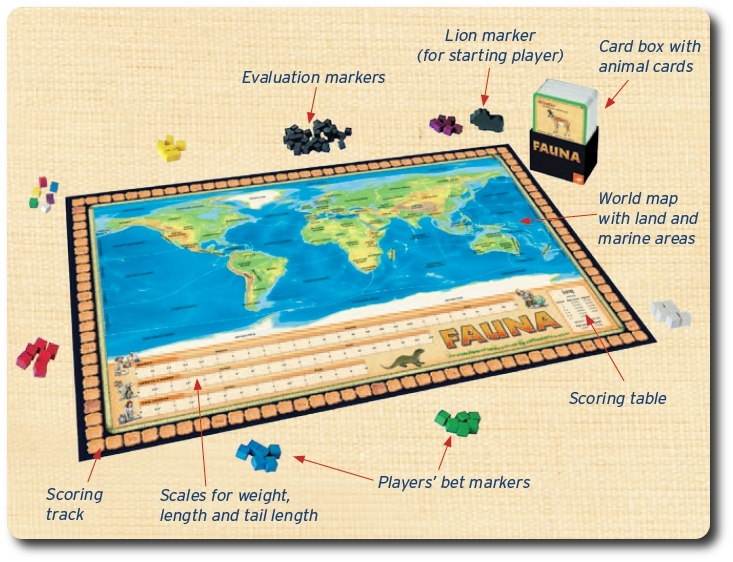 Fauna is comprised of a large double-sided game board (one side is metric units, the other side is imperial units) of the world and it’s oceans that also includes a bidding track and scoring track, 180 double-sided Animal cards (for a total of 360 animals), 1 Card box, 42 Bet markers (in 6 different colors), 30 black Evaluation markers, and 1 Lion marker. The markers are made out of wood and painted. The board is thick and has a beautifully illustrated map of the world on both sides. The Animal cards are also wonderfully illustrated and easy to read. The entire game is quality through and through. To set up the game, place the game board in the middle of the playing area with the your preferred measurement side (metric or imperial) facing up. Next, divide and give each player a set of colored Bet markers (7 per player), placing one of the Bet markers next to the scoring track space labeled with the number “1” located on the outside edge of the board. Remove and set aside the 30 black Evaluation makers. Lastly, determine the difficulty of the game. The Animal cards are doubled-sided. One one side are common and well-known animals (green border) and on the other are more exotic (black border). 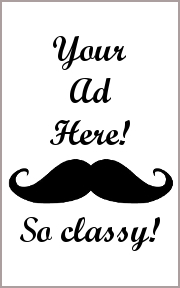 If you like, you are welcome to mix and match! Place as many cards in the Card box so that only the name and the illustration of the animal is visible. Once that is done, pass the Lion marker to the first player and you are ready to play! The real star of the game are the animals who are beautifully illustrated on the Animal cards. The Animal cards themselves are separated into two different halves, the upper and lower halves. The upper half contains the animal illustration, name of the animal, the animal class, and scientific name. Also included are the number of areas the animal can be found in its natural habitat and the measurements to be used during the bidding. We’ll discuss these in more detail in the next section. The lower half contains the animal’s zoological classification, the names of areas the animal lives, a world map highlighting those areas, and the physical measurements of the animal. When placed in the box, the lower half of the Animal card is hidden leaving only the animal names, class, illustration, and the number of areas and measurements to be bid on. Once the information for the animal is needed after all the players are done bidding, the lower half is revealed. The Animal cards are used brilliantly in the game and are also fun to just look at! When ready, an animal is introduced to all the players for that round of play. Any player may take a closer look at the Animal card but must not remove it from the Card box. Listed on the Animal card are the number of areas the animal lives in and the measurements (weight, length, and tail length) that can be bid on by all the players. Note that not all the measurements are used on some animals (for example, you won’t be bidding on the tail length of a snake). Once everyone has been given a chance to inspect the animal, the first player places one of their 6 Bet markers on either an area of the map or one the measurement bid areas. The next player, in a clockwise order goes next and so on. Once a Bet marker is placed, no other Bet marker can occupy that space. A player can pass if they so choose. If a player does elect to pass, they cannot place any additional Bet markers for the rest of the round. Once all the Evaluation markers are in place, all the players have passed or a combination of the two, it is time to score points. The Animal card is removed and the black Evaluation markers are placed in the areas where the animal lives and in the correct measurement areas. 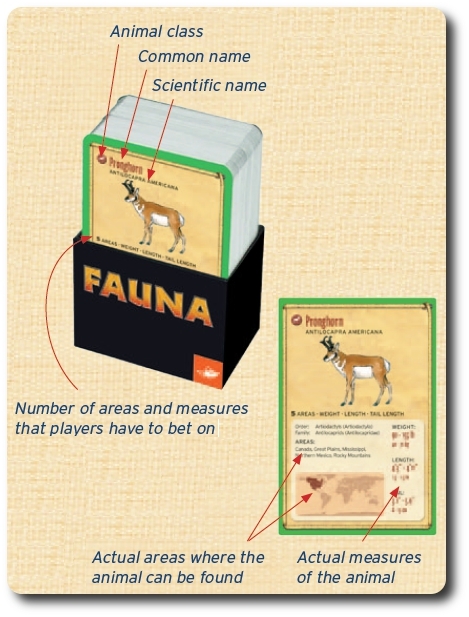 The lower half of the Animal card has all the information needed to quickly place the Evaluation markers, including an illustrated map for easy and quick reference and marker placement. Points are awarded to players who have guessed correctly but are also awarded to players who placed a marker adjacent to the correct area on the map and adjacent to the correct measurements. Seven points are awarded to players who guessed the measurements correctly and 3 points are awarded to players who bid in spaces adjacent to the correct measurement. The number of points awarded for map areas is based on the number of areas the animal lives in. If the animal lives in only a few places, the points scored for placing the Bet marker in the correct area and adjacent area are quite high. If the animal lives in a large number of spaces, the points awarded are much less. All the points are added together for each player, with one Bet marker only capable of scoring points once, and the total number of points advancing the individual player’s marker on the outside scoring track. Remove the Evaluation markers and the scored Bet markers from the board. Once completed for each player, the requirements for game completion are checked. If the requirements are not met, the game continues. All Bet markers placed that did not score any points are temporarily set aside and not returned to the owning player. On the next round, all players who have lost one of their Bet markers are given one back to use. A player will always have, at minimum, 3 Bet markers. If they ever have less than 3, even when given a Bet marker at the beginning of the next round, they are given enough Bet markers to raise their total Bet markers to 3 immediately. Only one Bet marker can occupy an area on the map and on a measurement space at a time. However, there are no rules that state that a player cannot place their Bet markers adjacent to areas and measurement spaces they have already bid on. This allows the player with wit and a strong sense of bidding and area control to group their Bet markers. The end result, if they bid correctly, is scoring a massive amount of points and locking out their opponents. For example, if a player knows a land area is where the Animal being bid on lives, but a Bet marker is already placed there, the player is welcome to place their Bet marker in the ocean areas that are adjacent to the land areas. The same goes for land areas that are adjacent to ocean areas. A player can also use their Bet markers to bluff and misdirect. A very viable tactic is to spread out the Bet makers to not only cast a wide net but to also to confuse and misdirect opponents who might be making choices based on your Bet marker placement. The game ends when a player reaches a certain amount of points on the outside scoring track. For 2-player games, the first player to 120 points wins. For a 6-player game, the maximum number of players, the first player to 80 points wins. To learn more about Fauna and read the complete rules, visit the official web site. Fauna looks outstanding, and just by reading the rules, would appear to play brilliantly. At first blush, it looked to be a game that was based around the old zoo animal cards I collected as a kid. The Animal cards certainly appear to be somewhat derived from that design, and there is a good deal of scientific and educational information on the cards to make one pause and think how this could be used in a game at all. Before I was even able to start teaching the game to my little geeks, they jumped on the Animal cards and started to go through them one-by-one. They were fascinated by some of the animals that they swore they had never seen before. Anytime they did come across an animal they recognized, they would launch into a long narrative that described when and where they saw the animal and their thoughts on the animal’s merits. This started a number of rather heated debates between my two oldest little geeks whenever one of them disregarded the value of an animal that the other held in high regard. Silliness to say the least. Eventually, the great debates between the 4 and 7-year-old died down enough for me to interject and to pitch the game. Although, in truth, I hardly needed to. They were already so completely enamored with the Animal cards, they would eagerly accepted any game system that used them. In fact, in the short time my little geeks had their hands on the Animal cards, they had already devised a rather simple game around them that sounded something like a Pokemon battle. The Animal cards also drew the attention of my wife and my mother and I ended up explaining the game to the entire family. Because the game has rather light rules, it did not take long to describe and demonstrate how the game was played. I spent the majority of my time focusing on the bidding and area control aspect of the game. Failure to understand how one can block, out bid, and hedge bids is the single most important aspect of the game, in my opinion. You could know nothing about the animal, but if you watch what other players are doing, you can at least get some points every round. There is only one rule in the game I will not be using when playing with my little geeks and that is the rule that penalizes the player for placing Bet markers that do not score points. I appreciate this rule and plan to use it fully when playing with adults or older children, but for my 4 and 7-year-old, the removal of a Bet marker is just a bit too harsh. My goal is to challenge them while they are being entertained. If I reduce their Bet markers, they will quickly be left behind and their overall ability to play will be greatly trumped. 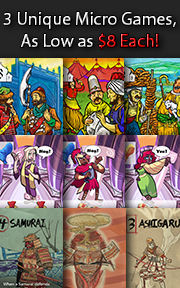 Once I was satisfied that all the players understood the rules and how the bidding worked, I reset the game board and asked each player, in turn, their thoughts on the game so far. It would appear that the group is already head over heals and is very eager to get the game going! Let’s see if the game continues to entertain and get much geek love or is nothing more than a passing fancy. Fauna plays brilliantly and appeals to me on many different levels. First, it was easy to play and fun. This made it all the more enjoyable for my little geeks and the entire family. The game is also incredibly fast paced and exciting. This was a real surprise to me as the rules did not necessary communicate to me a fast-clipped and tension filled game, but it was. Each round became a mental race and somewhat combative as each group sought best placement for points. Second, the game is educational without being all in your face about it. One of my pet peeves about any game that has an educational slant is when they make it a point to tell you it is educational. That’s silly, in my opinion, unnecessary and something of a turnoff. For example, if you were to tell a group of kids they were going learn fractions, you’d most likely get groans, but if you told them you were going to play a game where each player was an intergalactic trader and they were going to need to divide up their goods, you’d spark all the children’s interest. In other words, I’m talking about presentation here. The educational merits of a game will be clear once they are played and there is no need to announce them as they will be introduced and used in the act of playing the game. Fauna makes no mention of teaching anything, but it is clear everyone at the table does. I learned more about animals in a single sitting of a game than I had learned the entire month. Third, the bidding aspect of the game is simply outstanding. At no time did anyone in the game not get points which allowed even my 4-year-old to keep up with the pack and make some serious points to boot. The subtle area control aspect of the game was not lost on any of the players and we raced to claim areas of the board, both on the map and on the measurements that we thought were sure winners. When the big reveal came after all the markers were placed, the energy shifted from surprised, elated, and disgusted with each Evaluation marker. A number of times I completely guessed wrong on animals that I was absolutely certain lived in a specific area of the world or were of a specific measurement. Humbling to say the least, but also exceedingly rewarding. On the first night we played the Fauna, we had to play two games. The first game was with the little geeks and it was a blast. When they were all snuggly in their beds, the adults returned to the table for another game! We just couldn’t get enough of it. And if you are worried that the game has limited replay value, I remind you that there are 360 Animal cards that can be shuffled and randomly placed. Only the most studious of biologist will ever have the upper hand. The entire family enjoyed playing the game! Gamer Geeks, this might come as a surprise, but this animal game is a wonderful “gamer’s” game. 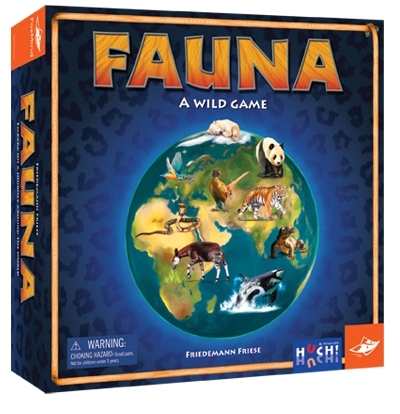 It is very much knowledge-based, which is almost something of a death sentence for most games, but Fauna saves itself from being overlooked by the game elitists by using bidding and area control. These two game mechanics elevate this game to a higher level of interactive and competitive play that pits not only a player’s basic knowledge but also a shrewd exercise in out maneuvering the other players. Points can be stolen and jumping on the coattails of others to claim points is common place. You’ll find yourself placing Bet markers in areas that you absolutely know will not score points just to throw off your opponents or not bidding at all because you don’t want to give free points away. You’ll quickly see that this animal game is all teeth and teaches you something at the same time. A rare game indeed! 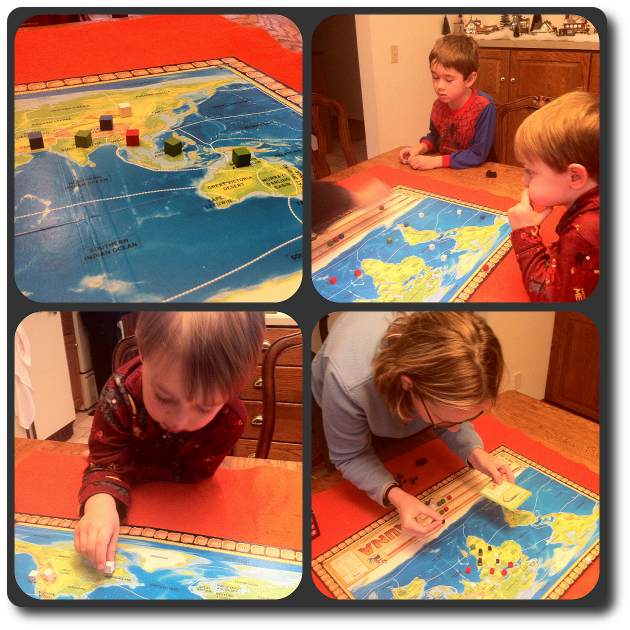 Parents Geeks, this is an outstanding educational and family game! You and your little geeks are going to learn about animals, geography, math, and measurements. It doesn’t matter if your little geek (or even you) have never heard of an animal before. Use the visual clues provided by the animal illustration to determine where in the world such a creature would exist. Place your markers and then learn all about the animal when revealed. You and your little geeks are going to be amazed at the wonderful and sometimes very strange world of animals at every turn. When you walk away from the gaming table, everyone is a winner and is just a little bit smarter, too. And a special note to educators! Fauna will teach and entertain your students and can be easily formatted to a classroom format with students working as teams or all playing against each other! Child Geeks, this is a fun and fast game where you get to think about where the common to exotic animals of the world call home. Do you like going to the zoo and seeing all the wonderful animals and learning about how they live? Fauna is like going to the zoo, but instead of being packed up and shipped off in the family car, you get to explore the world of animals from the comfort of your own home. When a new animal is shown, think carefully and use the clues you can see by using the animal illustration. Does it have white fur? If it does, you can bet it lives where it is cold and mostly snowy. Does it have flippers? If it does, odds are very good it doesn’t live in the mountains! Before you know it, you’ll know a good deal more about animals you’ve never even heard of and want to learn more! Fauna is an absolute gem and a rare one at that. There are not many games that are knowledge-based, entertaining, challenging, and highly accessible. Fauna scratches all my itches, from Geek to Parent, and is greatly loved by my little geeks, too. I would eagerly put this game in front of my elitist gamer friends and non-gamers alike. It appeals to my gamer and intellectual nature and thrills me with each new animal that I have never heard of and get to learn more about. If you are looking for a game to play with family and friends, Fauna is a sure thing and you owe it to yourself to try this game as soon as possible. Tagged Animal Games, Educational Games, Father Geek Approved, Gamer Geek Approved, Parent Geek Approved, Trivia Games. Bookmark the permalink. My boys love all things animals and this game sounds perfect. However, I am concerned about the accuracy of the facts on the cards. Did you notice a lot of errors? Others have commented about mistakes and my 9 year old would highly disapprove of the game if there are a lot of errors. He KNOWS his animals. Thanks for reading the review and leaving a comment, Lisa. Sorry, I have no idea how accurate the facts are about the animals. In fact, this is the first I’ve heard anyone suggest the game was inaccurate. I didn’t observe anything to suggest that the cards were blatantly incorrect. I did disagree with some of the cards, but only because I thought differently. I’m not an animal expert, sad to say. I do know my dog is lazy, but I don’t think that helps.